One of the ways you can save money as a business owner is by hiring interns to help out with some of your tasks. A good intern can be a great asset for a few months, and you can receive some valuable help for a low cost. However, it’s important that you manage your interns properly, especially since the recent flap over unpaid interns. 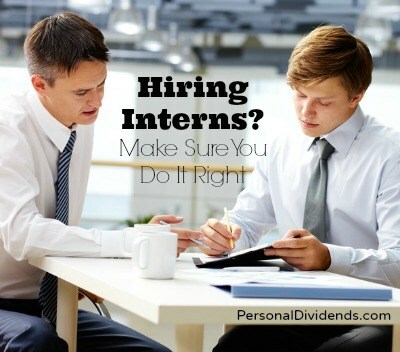 Intern programs can be beneficial for everyone involved — as long as they are run properly. First of all, it’s important to remember that the intern is supposed to derive most of the benefit. Yes, you are getting low cost help. Which is great for you. But you also need to provide something substantial in return. You need to meet the requirements for the university if your intern is trying to earn college credit. You also need to provide solid training and experience so that the intern actually learns something he or she can use. Mary Shafer, Publisher at Word Forge Books, has used interns in the past, and has some insight into how to make sure that the experience is positive for everyone involved — even if the interns aren’t being paid. “I learned ahead of time how their internship would be graded, and suggested to their independent study counselor that she provide me with guidelines to help the work I gave them align with skill learning requirements for the semester,” says Shafer. Once she had that information, Shafer says that she created time sheets for each of them, describing tasks, and marking hours, so that it was easier to track internship hours for the appropriate amount of credits. Even though she doen’t have to Shafer does present her interns with a “thank you” stipend at the end of the internship. She also provides a personalized letter of recommendation that can go in interns’ portfolios, and makes herself available as a mentor later on. Many people complain about interns, but how would you feel if you were doing work no one wanted to do, learning very little, and not getting paid for it? You can see better results from your interns when you offer a good environment. Provide meaningful work that they can learn from, and act as a mentor as well as a boss, and your interns are more likely to do a good job, and be happy about it. There are some things in life more valuable than mere money, and the experience, skills, and connections gained from a good internship can be priceless.